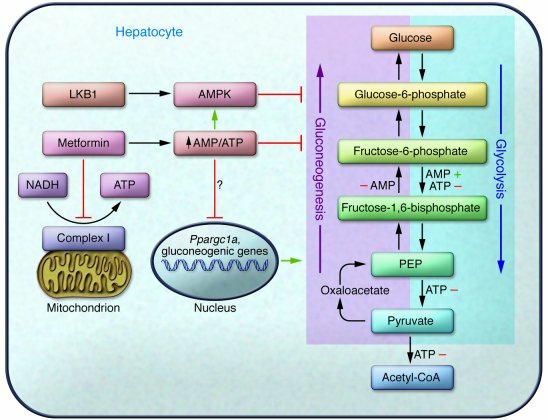 Regulation of hepatic glycolytic/gluconeogenic pathways. Metformin inhibits mitochondrial complex I and increases the AMP/ATP ratio, which leads to the activation of the energy-sensing kinase AMPK. Foretz et al. (12) show that activation of AMPK is dispensable for metformin-induced reduction in hepatic glucose output. While multiple regulatory points exist for direct AMP- and ATP-mediated effects on glycolysis and gluconeogenesis, the mechanism of energy charge regulation of gluconeogenic gene expression described by Foretz et al. is currently unknown. PEP, phosphoenolpyruvate.